Any woman who has been a nurse knows that her sainted sisters in literature, movies and TV are idealized virtually beyond recognition. Saints they may be, but the lives of real nurses are not so much inspiring or uplifting as they are mean, exhausting and thankless. It takes one to know one. So Carol Gino, a 40-year-old registered nurse with 16 years of experience, has written an autobiographical novel so candid and gritty that it may shatter the old stereotypes forever. 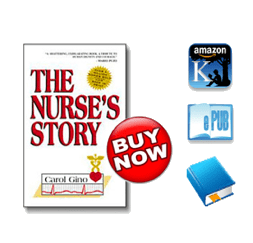 The Nurse’s Story, Gino’s first book, has been grabbed as an alternate by both the Macmillan and Book-of-the-Month clubs and is heading toward the best-seller list, while Gino herself is finding that darting around the country on the personal-appearance circuit is easily as wearing as hospital work. So steeped in reality is The Nurse’s Story (Linden Press/Simon and Schuster, $14.95) that to call it fiction seems scarcely adequate; the story bristles with details and case histories that only experience could have provided. Teri Daley, the narrator, is grossly underpaid and overworked, burdened with responsibility but little authority, yet often held accountable for the blundering of doctors. In harrowing, sometimes gruesome passages still fresh with pain, Teri ministers to patients so disfigured with cancer or burns that they barely resemble human beings, while other patients are so psychotic, tragically terminal or deformed that only sheer guts and bottomless compassion can see her through the long days and nights. Rocked by her own implosions of grief each time a patient dies, she finds the mundane quality of her own life mocking and barely tolerable. It was almost inevitable that Mario and Carol would become romantically involved. He introduced her to his literary agent and continued to encourage her. Still, Gino had a writer’s mind of her own. “The more she worked on the book, the less she listened to me,” he observes. “But I’m very proud of her. I think her book would be a hell of a movie if they did it right. It’s like those old Clark Gable and Spencer Tracy movies that are all about male bonding. I’d like to write the screenplay.” There may indeed be a film. Hollywood is nibbling at the possibilities, and if it bites, Puzo and Gino may work on the screenplay together. It was not dreams of Hollywood but law and teaching that first beckoned Carol. The older of two daughters of a kitchen cabinet salesman father and floral designer mother, she was raised in conventional, middle-class Amityville, Long Island. In 1959, shortly after high school, she put aside career notions and married a baby food salesman. She provided two customers for his product before divorce sent her into nursing in 1966. A second marriage in 1975 to a psychology professor also ended in divorce. Her daughter, Teri, 22, who is married to a photographer, recently had a baby, and Gino’s son, Danny, 18, works as a printer’s apprentice and lives at home in an Amityville duplex with his mother and her divorced sister, Barbara.